We all talk like Donald Trump now. Sad! 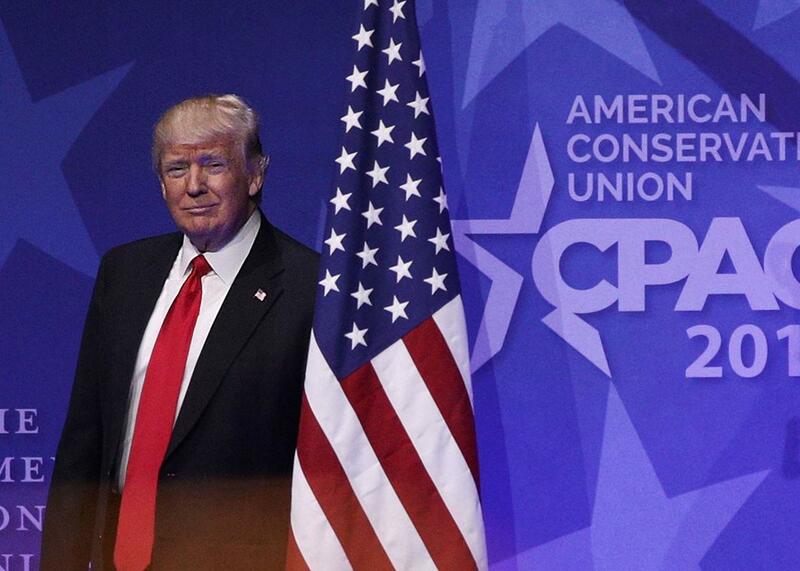 President Donald Trump walks onstage prior to his address to the Conservative Political Action Conference on Friday in National Harbor, Maryland. Where had that bit of Trump talk come from? Why had I allowed it to slide, serpentlike, into the sanctuary of my colleague’s newly expanded family? Was nothing sacred? During the campaign, we latched on to the Republican nominee’s catchphrases—“no puppet, no puppet,” “crooked Hillary”—because they felt so distinctive and newsworthy. Anyone could string together some believe me’s and failing so-and-so’s to build their own Trumpian linguistic train wreck. Now that he’s president, Trump’s tics continue to seep into the way we write and speak, whether we think we’re being ironic or just can’t help ventriloquizing the man on everyone’s mind. We’re all the puppet. It’s as if we’ve woken up inside the plot of an epidemiological horror movie. When Trump first appeared on the scene, he seemed like an orange flash in the political pan, a short-timer we could mock relentlessly until he disappeared. We thought we could inoculate ourselves by staging and dramatizing his stupidity for everyone to appreciate. Instead, the virus spread. Trump won the presidency, and now the whole country is symptomatic, parroting verbal tics that our own bad judgment helped lodge in our brains. Like Saturday Night Live, we tried to use satire to drive the Donald away. Instead, he’s swallowed us whole, a yuge python refusing to dance to the flute. It’s unsettling to think that Trump has colonized my Broca’s area. Before he earned the GOP nomination, my friends and I used to joke that he was God’s gift to small talk. Even at the world’s most awkward gathering, everyone would have something to say about the huckster–turned–presidential aspirant. Now that hypothetical has been nightmarishly inverted: At social events and in conversations, we open our mouths and all that comes out is Trump, Trump, Trump, like the wicked girl in the fairy tale who’s been cursed to drop toads and hornets from her lips instead of words. Sometimes, we adopt Trump’s speaking habits to undermine him. According to more than one wag, he didn’t just lose the popular vote—he lost it big league. Every morsel of news from the White House—the Muslim ban, reports of Russian encroachment on our democracy, assaults on the traditional role of the fourth estate—seems ripe for a “sad!” or a “bad!” or a “very unfair!” There’s undeniable righteous satisfaction in using Trump’s epithets against him, especially given the “I’m rubber, you’re glue” logic of his administration. He wants to disparage Vanity Fair’s numbers as “way down, big trouble”? Check out January’s scant inauguration crowds. He wants to assail the “dishonest media”? How about those “alternative facts”? But issuing those exclamations requires the critic to accept the premise of the criticized. It allows Trump’s reductiveness, grandiosity, and ignorance to loom large in our minds, to organize our impressions into the categories “sad!” and “bad!” as if they were legitimate categories rather than the outbursts of a child. Do these examples send up the president’s ridiculous assertion that facts can be discounted if they make him look bad, or do they breathe fresh life into his faulty assumptions? Consider, too, the various Hillary rallies in which crowds convened to chant “Lock him up,” hoisting Trump on his own sensational petard. Sure, turning the rhetorical tables feels good, but any battle that’s waged on Trump’s terrain, no matter the outcome, feels like a depressing defeat. Therein lies the danger of Trumpian mimesis: Emulating the president means embodying his worldview, however briefly or satirically. At best, the jokes sound gratuitous and reflexive, chosen for familiarity rather than critical insight. “Paul Zeise: Pitt in the NCAA Tournament? Sad!” blared the Pittsburgh Post-Gazette, atop a sports piece in which Trump didn’t appear. Headlines that play on the president’s signature style can also be depressing in their coarseness. “Trump, Trapped in His Lies, Keeps Lying. Sad!” the New York Times has taunted. It feels like the Gray Lady should be wiser and more nuanced than her target; this title says dumb braggadocio has won. But who am I to complain? The title of this piece is also a surrender. Writer, Trapped in Trump’s Sentence Constructions, Keeps Writing Like Him. Crap! We talk like Trump because we live in his country. Trumpish is our mother tongue.